There is no Azerbaijani holiday, whether it is the celebration of springtime – Novruz Bayram or such special occasion as wedding ceremonies, without pilaf or “Ash”. Rice is a popular dish in many Eastern and Asia countries and every country has its own recipe of delicious pilaf. In Azerbaijan, there are many variants to this beautiful, hearty dish -- there are pilafs with meat, chicken, greens, just to name the main types. Despite being an ancient dish, new variation of pilaf are always invented. To please your family at the forthcoming Novruz Holiday, you can cook Azerbaijani pilaf at home. Start with chicken pilaf, as it is most easy. For pilaf with chicken you will need 3 cups long-grain white rice, 4 tablespoon of melted butter, 1 cup of peeled chestnut, ½ cup of pitted dried apricots, 1 cup of pitted dried sour plums, ½ cup of pitted dates,½ cup of golden raisins, 700 gram of boneless chicken cut into cubes, 1 medium onion, saffron threads, salt and pepper. It will take you about an hour and a half to cook your pilaf. Pick over and wash the rice then soak it in warm salted water. Meanwhile, prepare the dried fruits and chestnut. You will need to stir-fry the chestnuts for about 3 minutes, then add the apricots, plums and dates and continue the frying process for another 3 minutes. In the end add your raisins and stir for a minute, then remove from heat. Combine 10 cups of water with 2 tablespoons of salt in a large pan and add the drained soaked rice - leave to boil for 10 minutes. Stir to prevent the rice from sticking to the bottom. Try one grain of rice. If it is half-cooked, drain the pan in a large colander. Rinse the pan and melt a tablespoon of butter so that it covers the bottom evenly. Arrange the chicken at the bottom and sprinkle with salt and pepper. Follow with a layer of sliced onions. Simmer over medium heat uncovered, without stirring, for 3 minutes to let the flavors develop. Place half of the rice on the onion layer, and then arrange the dried fruits and chestnuts in another layer placed on top of the rice. Pile the rest of the rice on top of the fruits, mounding the rice in the shape of a pyramid. Spread 1 teaspoon of melted butter over the rice. Using a clean tea-towel cover the pan firmly with a lid to absorb the steam. You can lift the corners of the towel over the lid. Cook the pilaf on low heat for 30 minutes, then sprinkle saffron water on it. Simmer the covered pan for another half an hour. The ready chicken must be golden with onion melted on it, while the rice should be separated and not sticky. If you have managed to prepare the pilaf, it will definitely enter the menu of your family for a long time. Another variation of pilaf you will definitely enjoy is Sabzi pilaf, which will take an hour of your time to prepare. You will need 225 gram of lamb, 50 gram of butter, 50 gram of onion, 1 bunch each of sorrel, coriander, mint, dill, wild leek, and young celery with leaves, 2 teaspoon of the juice of unripe grapes or lemon juice, if not using sorrel, saffron, salt and pepper. softened onions, saffron infusion and chopped herbs to the meat. Mix well, and cook with a lid on the pan on a low heat. For pilaf you will need 800 gram of rice. Rinse it in cold water, add to the boiling salty water and leave to cook for 10 minutes turning the heat down slightly. Strain the rice. For the crust known as qazmaq, mix 1 egg with 4 tablespoon of parboiled rice and 1-2 tablespoon of yogurt and add saffron water. In a rinsed and dried rice pan melt the butter and spread qazmaq on the bottom to fry for a couple of minutes. Add the rest of the rice to the saffron and butter. Use the lid wrapped in towel. Once the rice is steaming, turn down the heat and leave to steam for 30 to 45 minutes. Serve Sabzi Pilaf in a large dish accompanied with a bowl of mix meat and greens. You can also eat the dish with yogurt mixed with crushed garlic. 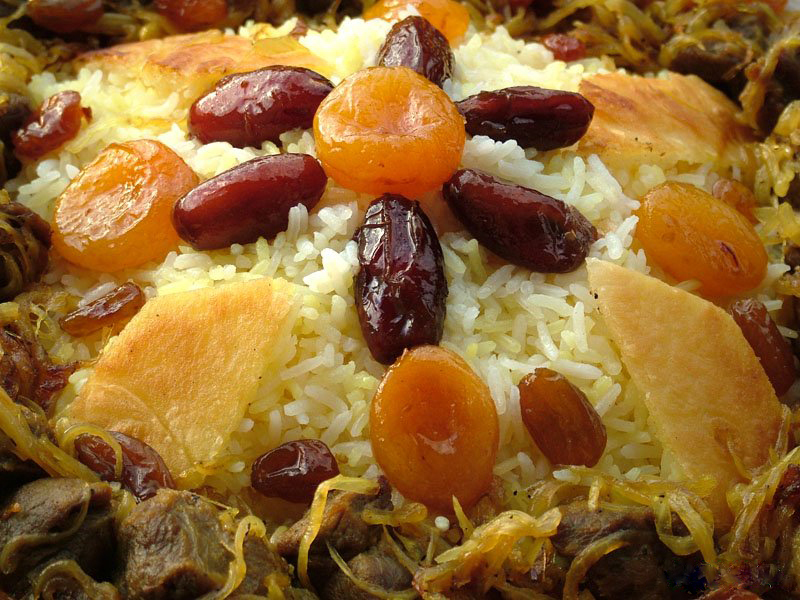 Hopefully, you will fall in love with Azerbaijani pilaf! Nush olsun!